911 Restoration of East Valley is the company that can offer homeowners a fresh start through quality mold remediation and water damage repair. We’re available 24/7 to provide homeowners of Chandler with repairs and restorations that can make any water damaged section of your home look good as new. When you notice any kind of fungal growth within your home, the problem needs to be addressed right away. When your home is exposed to excess moisture, that leak can attract mold. To prevent the spread of mold and to protect your home from damage, it’s important that the source of water be patched up and the moisture removed. When our team arrives on your property, we’ll get to work on resolving the problem by conducting a free inspection and estimate. Through our assessment we can recommend the proper solutions and offer you the most affordable price. Trust that our team can be there within 45 minutes of your emergency call. 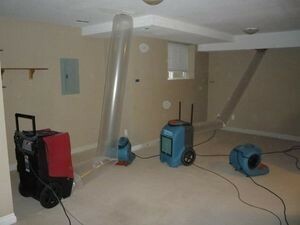 Mold is an issue that needs to be removed right away, so you can count on us to provide you with on the day service. Our mold removal Chandler pros are licensed, insured, and bonded to be able to give you a fresh start right away! The moment you notice water damage like roof leaks or pipe bursts, 911 Restoration of East Valley should be called right away. Our IICRC certified technicians have the equipment like infrared cameras to thoroughly inspect your home for hidden moisture spots and detect mold growth right away. If our sensors indicate bright red it means heat sources while blues mean cool spots. If our inspection sees a lot of blue areas throughout your home it could be an indicator of excess moisture. With our 35 years of experience, we can tell that the presence of moisture also means fungal growth. hermore, we’ll be creating a closed air system that will help us cycle air and dry the area more effectively so we can get rid of moisture along with any spores released into your home. To remove fungal infestation from your home, we’ll be using eco-friendly chemicals that will thoroughly clean surfaces without causing any further damage to your home. Keep an eye out for signs of water damage and mold growth! Check for black spots on surfaces like the walls and ceiling. Mold can pose a significant threat to both your property and to your health. 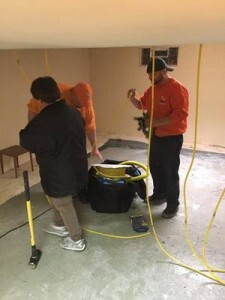 Mold should be expunged from your home immediately and our team of mold removal Chandler experts can perform the remediation and water damage repair for you so you can expect your home to get a fresh start without you risking your safety. For immediate action on water damage and mold growth, give us a call today!